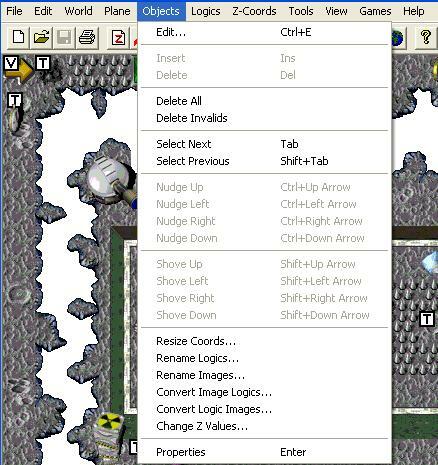 This will display the "Edit Objects" dialog box that is used to enter game logic information. See the "Game Logics" section for more information. Several drop-down menu itemz ghosted if no object selected. I don't think this feature does anything. This will delete a selected object. This will delete all objects in a level. This feature is not used often. This will delete all invalid objects in a level. I don't think you will use this since there should be no invalid objects in the shipped version of the game. This will select the next object in the level. This will select the previous object in the level. This will move the selected object 1 pixel in the desired direction. This will move the selected object 5 pixels in the desired direction. I have no idea what this feature is used for. This is a very handy feature for renaming the logics for all objects in a level that have a common object name. Important: Logic names are case sensitive! This is a very handy feature for renaming the images for all objects in a level that have a common image name. Important: Image names are case sensitive! This is a very handy feature for changing the logic name for all objects in a level that have a common image name. This is a very handy feature for changing the "Z-order" for all objects in a level that have a common logic name. This will open an Objects Dialog Box (usually) for the first Object created. Very handy!! !